Tap the mug with the pen and listen to the noise it makes. Particularly listen to the noise it makes at 90° from the handle and at 45° from the handle. You should notice that the note it makes changes as you change where you hit the mug. In line or at right angles to the handle it will be at a slightly lower pitch than at 45° or 135° either side of the handle. 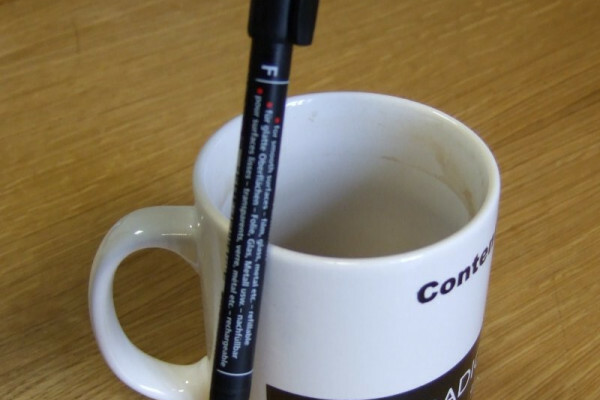 If you hit the mug with the pen it will vibrate, this then makes the air vibrate, which you hear as sound. When you hit the mug opposite the handle it will form into a slight oval because you have squashed it, the mug will then rebound and form an oval at 90°. This happens far too fast to see. As you can see in the diagram below to vibrate like this the handle is moving as part of the vibration. If you hit the mug at 45° a similar thing happens but with the ovals at 45° to before. This means that the handle doesn't have to be moved by the vibration so doesn't affect it. If you put a heavier string into a guitar it will make a lower note, in the same way if the mug has to move its handle to vibrate (at 90°) it will ring at a lower note than when it doesn't ( at 45°). But why does the pitch get higher the longer you stir it?